Sundance 2017: Inside and backstage the best industry bashes at the Sundance Film Festival with The Party Report’s Mikey Glazer, presented by the Kia Niro. Charlize Theron, Mary McCormack, and Chelsea Handler Pink hats and post-march clothes dominated the sidewalk style scene on Saturday after a sea of activism filled Park City for the Women's March. Here, the trio ducked in to the Hub at Park City Live, a sprawling hospitality lounge. 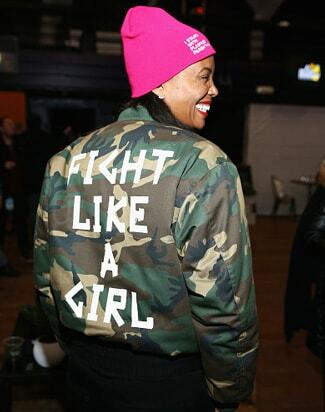 Aisha Tyler Tyler brightened Saturday's favorite uniform (the pink hat) with a jacket that echoed a famous refrain from UFC fighter Ronda Rousey: "Fight like a girl." Handler would end the day as many do: at TAO. Common In town a few days ahead of his movie premiere, the rapper was a surprise performer at the second night of the popular pop up nightclub. Vegas nightlife photography sorcerer Al Powers captured this pic, with event partner Don Julio's 1942 Magnum as the trophy that sat atop VIP tables. Not pictured: Jeremy Renner, Aisha Tyler and Mary J. Blige, all on the scene. John Legend Common's co-Oscar winner from two years ago for "Glory" made the rounds, stopping by this after-party and an event for his own WGN show "Underground" earlier in the night. Matt Damon, Marcus Samuelsson and Gary White A seated lunch at Sundance? Yes. On the busy opening Saturday afternoon, the trio sat at a "head table" while chalices of Stella Artois were raised by the crowd. The event promoted the film-friendly brew's commitment to Damon and White's Water.org clean water philanthropy. Jeremy Renner From one Jason Bourne to another... Renner was one of the many faces to pass through AT&T's Village at the Lift on Saturday (Jan. 21). The space has become an industry sanctuary this weekend. With minimal red carpet and flashbulb bombast, the photo-free Nobu restaurant and the Jeffrey Best-created "Cabin" restaurant/bar has had the same socially sticky bass line of Soho House. Jack Huston and Tye Sheridan Though it loosk like an introduction, these two star in "The Yellow Birds," a drama about soldiers in the Iraq War. Dave Bautista The former professional fighter's dystopian "Bushwick" opened up the first night of Kia Supper Suite at Firewood on Main, The Party Report's festival partner. With a line stretching down the street, the Kias pulled up to bring cast and filmmakers in to the space formerly known as Cisero's. Jason Schwartzman and prolific producer Lauren Selig were both spotted having private dinners earlier there on Saturday. "Bushwick": Bautista and Brittany Snow Inside the packed opening night event away from the slushy streets outside, Bautista and Brittany Snow warmed up in the VIP booths downstairs. The Breakout Actors of Sundance 2017 Meanwhile, photographer Jeff Vespa curated the breakout performances of Sundance for his annual "Verge" list, a print book photo portfolio. At Saturday night's party at DirecTV's space: Margaret Qualley, Keith Stanfield, Harris Dickinson, Josh O'Connor, Haley Lu Richardson, Michelle Morgan and Danielle Macdonald. Vespa addresses the crowd at the traditionally an industry-heavy affair that proved as popular as ever in a new space that doubles as a cafe during the day. Michelle Morgan and Jeff Vespa There is heat for "the next big things." Before it was over, the fire marshal had to "shut down the door" as a safety issue -- meaning, nobody could get access regardless of status. Honored for "L.A. Times," Morgan was safely inside before the cutoff. Tiësto Meanwhile, up at Park City Live, Tiesto played an "open format" set for film "Before I Fall" and Gen-Z media powerhouse AwesomnessTV's party during Snow Fest. Straying far from the four-four house thump, Tiesto pulled from all areas of pop music, weaving together Drake's "One Dance," MØ's "Final Song," Bieber's "Let Me Love You," Yeezus era Kanye, Twenty One Pilots' hit "Ride" and hip hop breakout 21 Savage alongside The Killers and his own hit "Red Lights." It was a musical #PotLuck. Justin Verlander and Kate Upton At Tiesto's next door neighbor, Rock & Reilly's, we learned how it pays to be Kate Upton. At a Golf Digest event with Conde Nast on Saturday afternoon (Jan. 21), the supermodel revealed her first golf lesson came from the late great Arnold Palmer. Keanu Reeves, Mimi Kim and Brian Malarkey Buffalo ranch octopus, steak and the one-time "Matrix" man were on the menu at the second night of ChefDance. We know Chef Malarkey from Herringbone at the Mondrian in L.A. and Searsucker in Vegas. Christina Robinson The former "Dexter" star passed through Debbie Durkin's EcoLuxe Lounge -- the sole survivor of the formerly thriving gifting suite industry. In addition to providing "hangover, altitude and anti-aging IVs," the organizers focused on promoting their charity partner Shriners for Children Medical Center. Roxanne Shanté The hip hop pioneer of the early 1980's (center), who fueled one of the first "rap wars," has a biopic debuting on Sunday, "Roxanne Roxanne," lifting the chorus of an early hit. The team behind Sundance 2015 sensation "Dope," Pharrell Williams and Forest Whitaker produced the feature. Kate Micucci Kate broke off from the roving ensemble of "The Little Hours" to hit The Hub at Park City Live on Saturday afternoon, a sprawling hospitality lounge with a climate change activation and a pop-up studio from Marie Claire magazine. Barry Rothbart Rothbart stars with "Fargo" Season 1 breakout Allison Tolman in the series "Downward Dog," which premiered its first four episodes at Sundance. But first... the Hub at Park City live for a photo set up by the nonprofit Cool Effect, a climate change advocacy group. Artist Bennett Slater and Morgan Spurlock It's not all motion picture arts and sciences here in Park City. There's also visual arts. Documentarian Spurlock led an artists' panel at the Kimball Arts Center on Saturday afternoon. Fares Fares and 4K Only weeks after throwing CES, the Consumer Technology Association set up an array of 4k TV's in a suite on Main Street to make a case to the content community: "Consumers want 4k. Make it." In addition to VR -- which is everywhere at the festival -- the second biggest consumer technology distribution topic is 4K. "Directors love it," one of the CTA reps told The Party Report, while hinting that some actors were nervous about being able to see every pore on a face.